The total landmass of Croatia is 56,538 sq km and the territory includes an additional 311,139 sq km of sea. 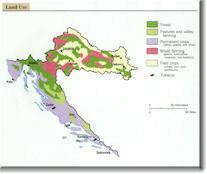 The topography is divided into the lowland basin between the Sava and Drava rivers (the Pannonian Plain), the mountainous karst region of the Dinaric Range and the littoral which runs from Istria south through Dalmatia along the Adriatic coast. Croatia's rivers belong to either the Black Sea basin or the Adriatic basin. The longest and widest river is the Sava and its tributaries, part of the Black Sea basin. Also important is the Kupa and Korana in the centre, the Drava in the north and the Danube in the east which forms a border with Serbia. Some of the Adriatic basin rivers include the Cetina, Krka, Zrmanja and Rjecina. Around 36% of Croatia's land is forested. The continental lowlands of the north are composed of common oak while durmast oak and hornbeam characterise the continental mountains. The regions of Lika and Gorski Kotar host beech and fir forests while the highest peaks of the western Dinaric range are under mugho pine. Mediterranean and sub-Mediterranean vegetation characterise the littoral and the Croatian islands.